The latest version of Fedena 3.1.1 has come up with a lot of new modifications and features. Today, we are going to talk about the new Past Timetable Edit feature that allows you to edit any past timetable. Read the article and know how the new change in past timetable can be done. During the old scenario, you were not allowed to make any edits in the past timetable. In this case, if you were to make changes for a particular batch for any subject, you had to go through the ordeal of creating a fresh new timetable for it along with assigning of teachers to the changes you make to the timetable. 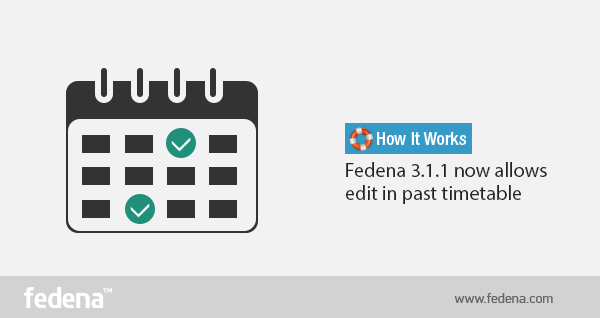 But with the new version of Fedena 3.1.1, you can now make edits to the past timetable. Select the particular period for which you want to make the changes. Select the start and end date and click on ‘Edit entries’. You will get the message regarding the edit as shown above. Note: When you make edits to a particular timetable, you should note that all subject-wise attendances related to the particular timetable (time period) will be deleted. Next PostNext Fedena 3.2 is Out and Running!